MISSISSAUGA, ONTARIO – She could hardly believe her ears. 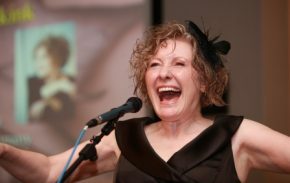 As an excerpt was being read from her bookThe Third Grace, Deb Elkink was both astonished and elated at being selected as the Grace Irwin Award winner at the 24th annual Canadian Christian Writing Awards gala. Elkink skipped to the podium to the delight of the 200-plus attendees gathered in the World Vision Canada auditorium. The $5,000.00 award – donated by John W. and Eleanor Irwin – represents Canada’s largest literary award for writers who are Christian. It recognizes the best book published during the previous year. This year, five of the 53 books entered were shortlisted for the Grace Irwin Award: Deb Elkink, The Third Grace; Erin E. M. Hatton, Otherworld; Greg Paul, Close Enough to Hear God Breathe; Jayne E. Self, Murder in Hum Harbour; and Ann Voskamp, One Thousand Gifts. Greg Paul and Jayne E. Self each received an Honourable Mention. The annual writing awards, sponsored by The Word Guild, celebrate the best in Canadian writing in periodicals, anthologies, and books by authors who write from a Christian worldview. These awards have been given since 1988, when they were known as The God Uses Ink Awards. This year, 360 entries were received for 35 different categories, from British Columbia, Alberta, Saskatchewan, Manitoba, Ontario, Quebec, New Brunswick, and Nova Scotia. Submissions from Canadians living in the United States and Uganda were also entered. Elmer Thiessen of Waterloo, Ontario, won in two categories – Apologetics/Evangelism and Culture – and received an Award of Merit in the Academic category for his book The Ethics of Evangelism: A Philosophical Defense of Proselytizing and Persuasion. Wendy Nelles, co-founder of The Word Guild, won top prize in Article-Inspirational/Devotional and Awards of Merit in Article/Long Feature and Article/Profile/Human Interest for her article “Soulmates” in the popular anthology A Second Cup of Hot Apple Cider. Notable among the awards is that sixteen articles from A Second Cup of Hot Apple Cider were shortlisted and nine of these won either first prize or an award of merit. Carolyn Arends of Surrey, BC, who won for “Satan’s a Goner” and “Going Down Singing” (Christianity Today). Professor John Stackhouse received an Award of Merit for “Get Out the Chequebook” and “Listening to the New Atheists” (Faith Today). The night culminated with the presentation of the Leslie K Tarr Award for Lifetime Achievement to Jean Vanier, author of nearly 30 books, including the classic Becoming Human, and the founder of L’Arche communities worldwide. Many of the finalists and guests at the celebration, along with others from across Canada, are meeting from June 14-16 at the 28th annual Write! Canada conference in Guelph – Canada’s largest conference for writers who are Christian. Although A Second Cup of Hot Apple Cider anthology was published in 2011, the book itself was not entered because of its close ties to the leadership of The Word Guild. Individual authors, however, were free to enter their chapters in appropriate Article categories.